The Show Skipped Reasons tool displays the reason(s) why CopyStorm/Restore failed to restore records. Category — the general type of reason a record was skipped. Most reasons use the category “Default” but some, like Lead, may use the category “Unsupported”. “Unsupported” reasons are due to the Salesforce API not supporting the operation. Table — the name of a table with skipped records. These parameters may be set at the top of the Show Skipped Reasons dialog. If not set, all values are displayed. In addition a search string may be specified, limiting displayed records to those whose reason contains the search string. 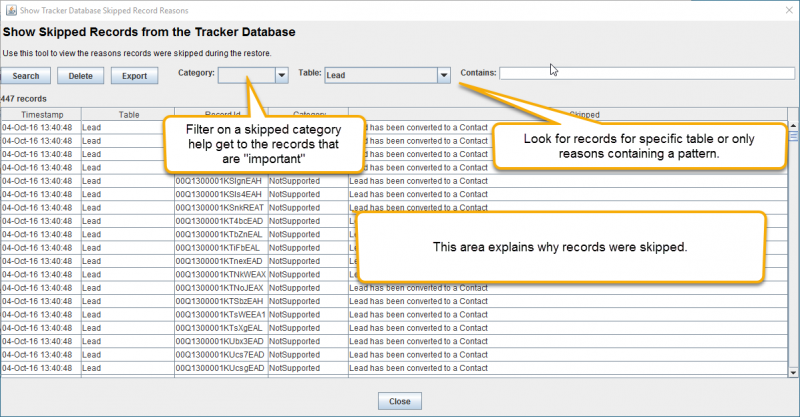 The “Delete” button deletes skipped reasons from the tracker database. The “Export” button saves skipped reasons to a CSV file.